In the 1980’s Mitsubishi made a series of amplifiers that are somewhat unknown, however they are really standouts in the their class. The DA 30 is a plain looking 105w RMS per channel power amp. It is not till you open the case does the design reveal itself. The amp is basically a dual mono design, with two transformers and separate power supply for each channel, and unlike others of this vintage (NAD, APT etc) this unit can only be operated in Stereo. The power supplies are completely independent, with 2 10kuf caps per channel. The input/voltage amp and bias sections have their own independent regulated power supply which is tapped off each transformer separately form the output stage power supply. The front end of the amp uses a dual FET for the input stage (2SK109) which then feeds the voltage amp stage. There are two inputs marked AC and DC. The AC input has a cap (non polar) across the input whilst the DC input does not. There is a volume control on the back panel- though generally this is set and full open. 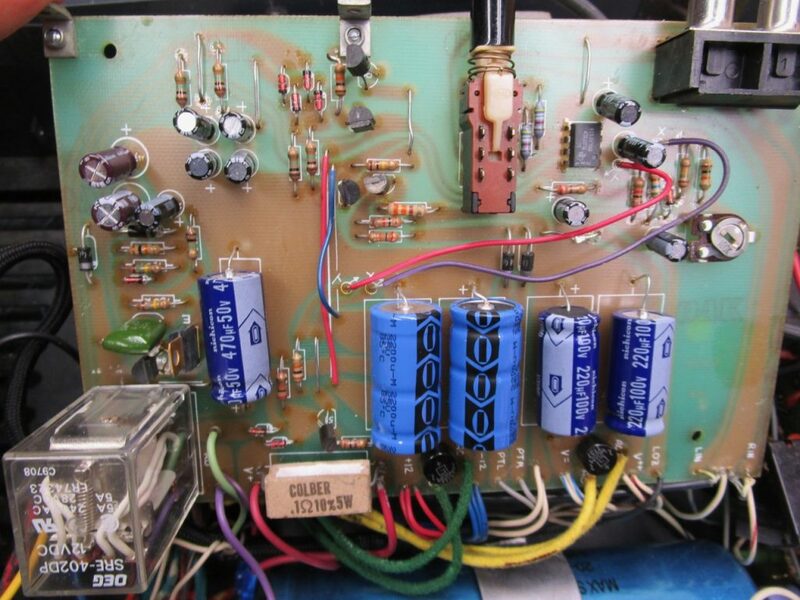 There are no capacitors in the audio path through out the whole amp. The main outputs are the well respected Sanken 2SC2837/2SA1186. There is an over power detection circuit and a protection circuit with independent relays for reach channel. The two front panel leds indicate power and protection status. 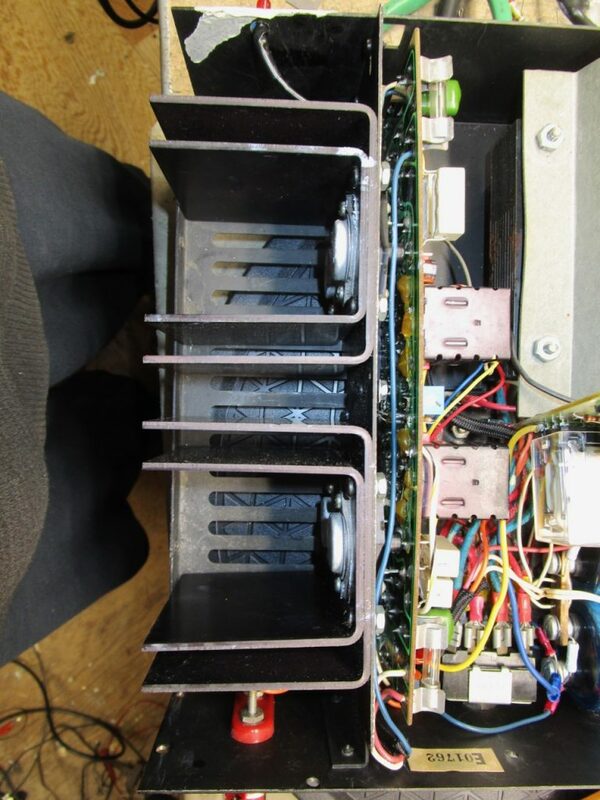 The other unique feature is the heatsinks which use a copper “heat pipe” coupled to a set of fins, which appears to do a very fine job of handling the thermal energy from the amp. So having examined the amp, of course this looked like a great amp to upgrade! So all the electrolytic caps have been replaced with low impedance types, Nichicon PW and HE, as the are all associated with some form of power delivery. Where appropriate some values were increased, though the original design provided adequate capacity. The outcome is a very good sounding amplifier, neutral and quiet and transparent- in fact so much so that I use one as my “reference” in the lab- connected to a modded APT pre amp and B&W speakers. The sound is simply whatever the music is delivering, the bass is tight the mids and highs neutral, with plenty of power for transients and excellent dynamics. This amplifier is certainly underrated and deserves its place with the other stand outs form that period , the NAD 2200 and APT 1. There is support for 2 sets of speakers, which can be switched on the rear or remotely via a separate meter bridge which is connected via the 8 pin socket seen here. note the “bumps” which are where the heat pipes are situated. I have worked on a number of APT Pre amps and have been impressed with their performance, so I decided to see how the APT Power amps performed. These are truly amazing amplifiers, the circuit is DC coupled- so no capacitors in the audio circuit path- which matched modern design principals and was very innovative for the time. They include a DC servo which tracks input and output to reduce distortion to a minimum- again innovative for the time. A single IC on each power amp board uses the two channels of the original TLE072 as an overload detector and a DC servo. In the updates I installed TLE2072 as a lower noise replacement. On the power supply there are two 10000uf 75v main supply caps, to which I have added a 4.7k 2w resistor to drain them, as they have a nasty habit of retaining their charge(which is clearly explained in the manual and on the amp itself. I have tried to find replacements that fit, but to no avail and all the ones I have worked on (5 to date) have tested well.- Also they are -10% +50% types. 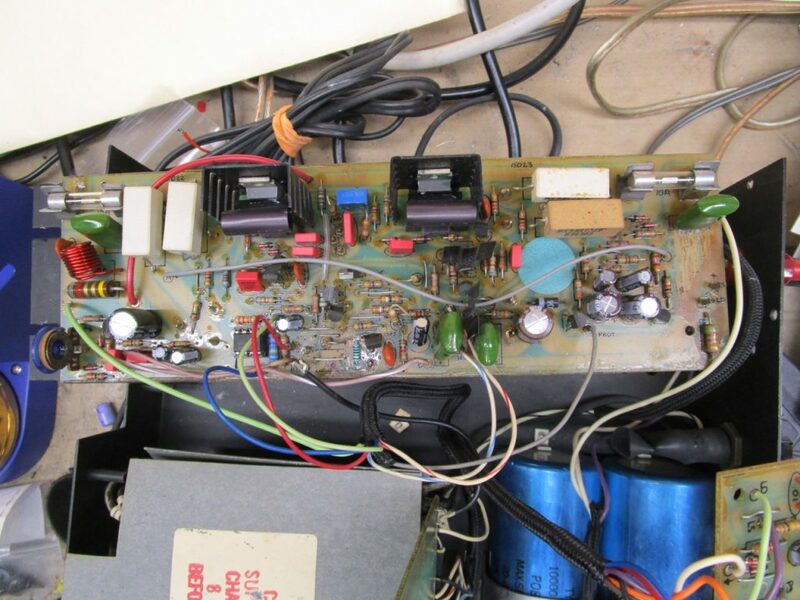 The Power supply board electrolytics were all replaced with either low impedance or low leakage types for the small values the larger values were increased somewhat. The IC acts as a comparator, again a TLE072 which was left as is. The mono/stereo switch and the relay were replaced as both were noisy. 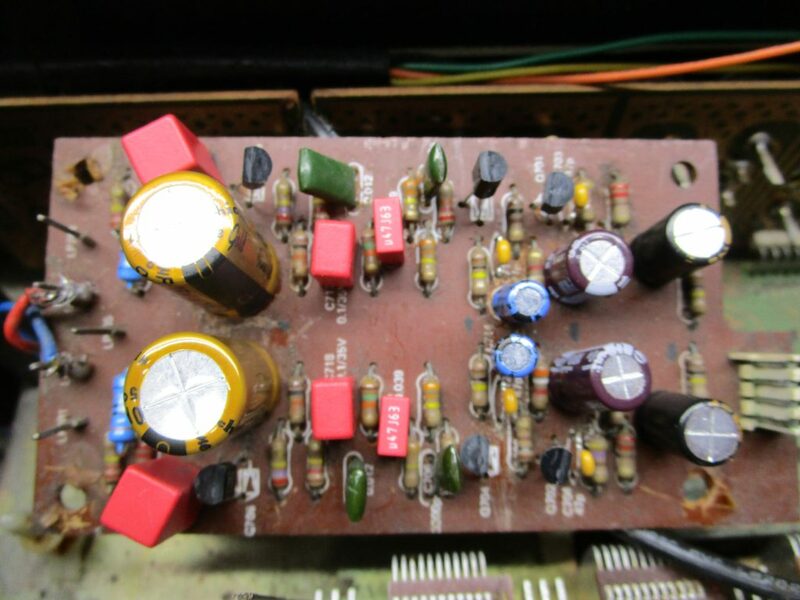 The power amp boards have had all the electrolytic caps replaced- with low impedance, low leakage and where appropriate film caps. Most of the of the ceramic caps have also been replaced with film types, or NG0 MLCC ceramics as appropriate. Also the input resistors have been replaced and the input decoupling cap removed. 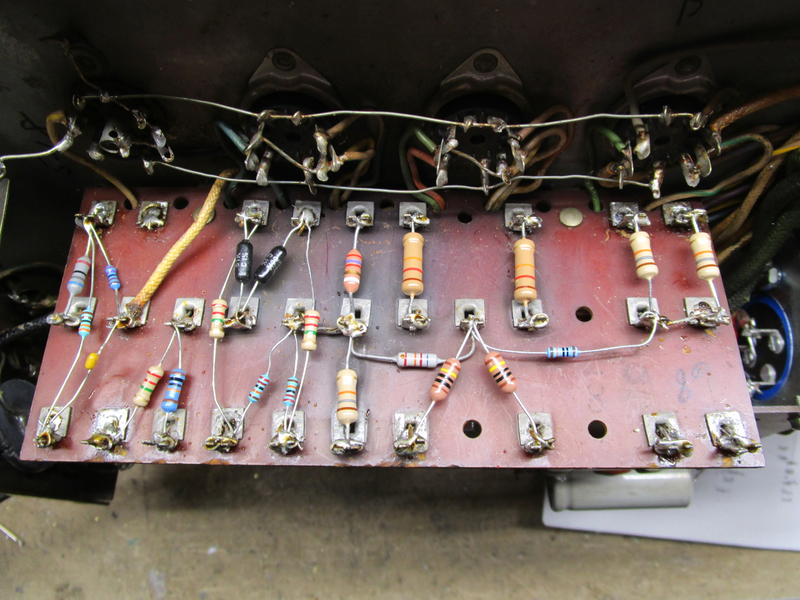 The wiring can present challenges when working on the boards, so each connection is checked, and as they are relatively compact there is some fiddling involved in removing the amp boards from their heatsinks. The result though, especially when run as mono blocks is astounding- they have great dynamic range, transparency and detail. The combination with the upgraded APT pre amp punches well above its weight in terms of cost/performance- and of course they have that great retro cool look. Revox was the consumer brand of Studer, who made some of , if not the, best analog tape machines used in the worlds great recording studios. Back in the day I worked on the A80 (24 track and A800 (24 track) machines, sometimes slaved together to create a 48 track machine. 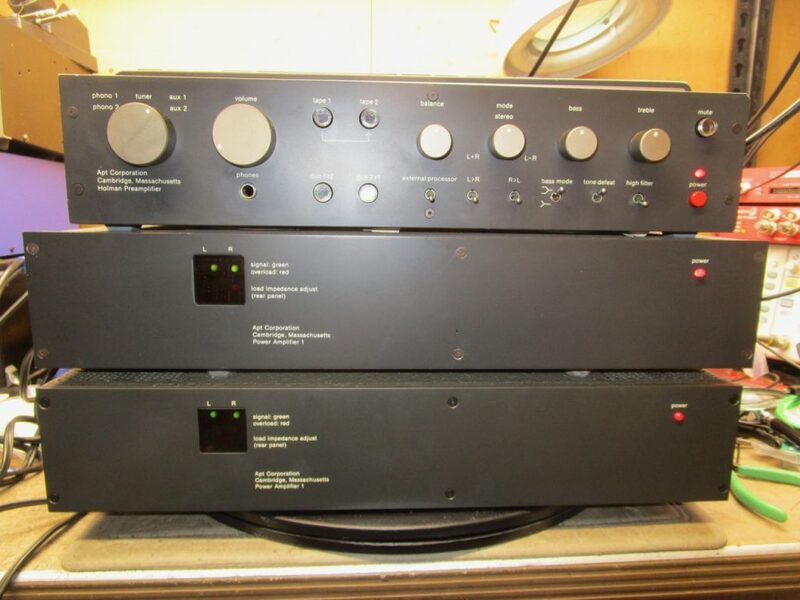 These all used 2inch tape (my favorite was Ampex 456) and were run at either 15ips or 30ips. My all time favorite was using the Studer 1/2″ tape machine running at 30ips (inches per second) to master onto as this captured all the information that the mixing console (SSL/Neve/Harrison etc) was capable of providing. Over the years I had owned a number of Revox tape machines, the A77 and B77 which were also excellent examples of electro-mechanical construction. So when my friend asked me to “recap” his B780 FM receiver, of which he had two- one purchased as a spare-I leapt at the opportunity. Revox HiFi gear has always been appreciated and was at the more expensive end of the spectrum when new, though as you were paying a premium, you got a top quality product! 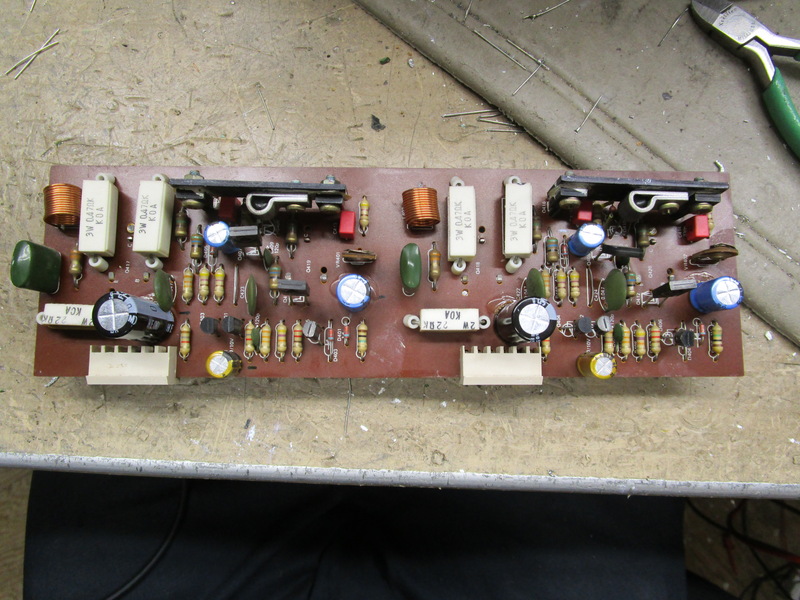 Power supply board: This board supplies the low voltage rails to all parts of the receiver, except the main power amps. At the time Revox, and a number of other European brands, for example Tandberg, used “Frako” electrolytic capacitors, which have not stood the test of time well at all. If you have a unit with these installed, then it is a very good idea to get rid of them. It was also very popular at the time to use Tantalum capacitors both for their small size and low leakage, and without wishing to add to the long running debate on their applicability for audio, I come down on the side of always removing them from the signal path or any audio related functions (including power supplies), however I do tend to leave them in place in RF circuits where they are not involved with the audio chain. So the power supply board is now fitted with new Vishay Electrolytic capacitors, as the mounting is axial rather than radial, and where applicable I tend toward the Vishay units over the Nichicon VX series. Additionally Nichicon KL low leakage types replaced some tantalums as did WIMA film for the lower value types. Finally Nichicon low impedance types were also employed. 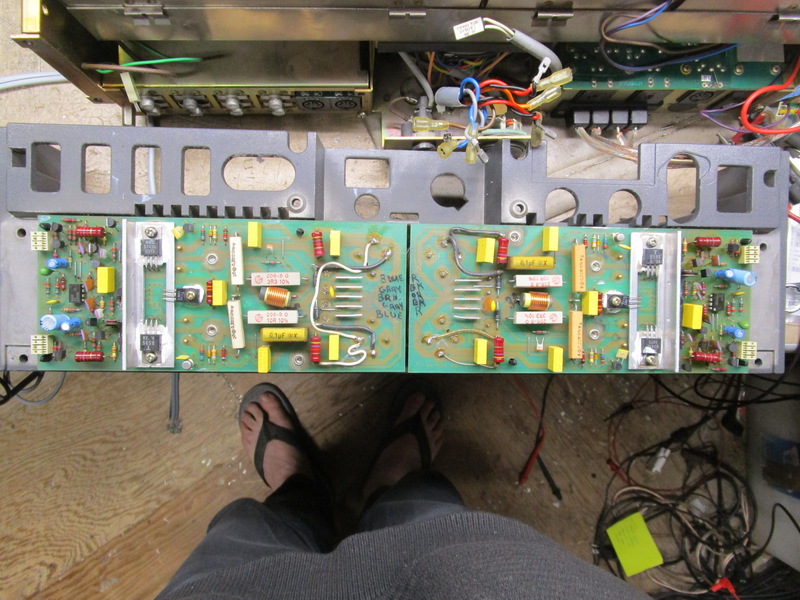 The three bridge rectifiers were also upgraded. Power amp boards: These have separate power supplies for each channel to provide sufficient independent power capability so that a heavy load on one channel will not drain these resources for the other channel. Although not quite as isolated as two independent transformers, this deals with most of the issues created by using a single supply for both channels, or worse a single supply for all the amplifier/receiver functions. I have read that there is a cogent argument for sharing a single transformer, though my personal preference is to have two completely separate power supplies. 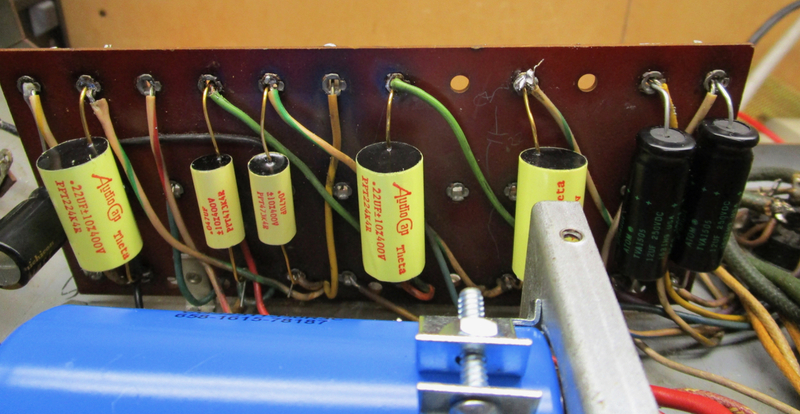 The photo shows new and old power amp boards side by side, with a polystyrene cap in place of one of the ceramics. Now the fun began. The power supply boards mount the reservoir capacitors an d bridge rectifier on the track side of the board- which makes their removal and replacement somewhat difficult. The capacitors have small stand offs and four connectors, of which only two are active, though fortunately a company (www.revox-online.de) provides a replacement kit of 4 10,000uf 63v capacitors that replace the original evo 4700uf 63v units. Without these it would have been extremely difficult to undertake this work. Having mastered the challenge of removing these, involving the use of a jewelers saw to get underneath the caps to remove them, the rest of the upgrades went relatively smoothly. There is another limitation to these units, which is that some of the PCB’s have tracks that lift with even the smallest amount of heat (applied with a Hakko vacuum desolder system), which resulted in having to track down minute and invisible breaks in the PCB or use the leads of the new components to replace lifted track. On one of the units there had been previous repairs undertaken, and I was relieved to see from this unit and read from others experience that I was not the only one with this challenge. On both units the output transistors had been replaced, in one case by a good choice and in another by an less good choice, so I replaced the now unavailable 2N6031/2N5631 with MJ15004G/MJ15003G respectively on the unit with the less good choice. 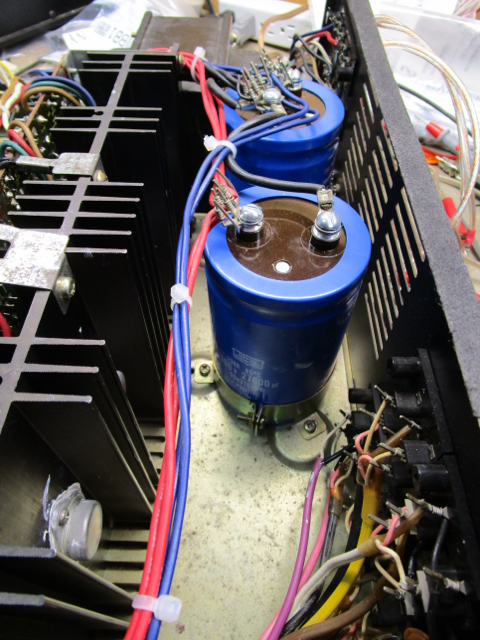 The original bridge rectifier was also upgraded in support of the larger value power supply capacitors. 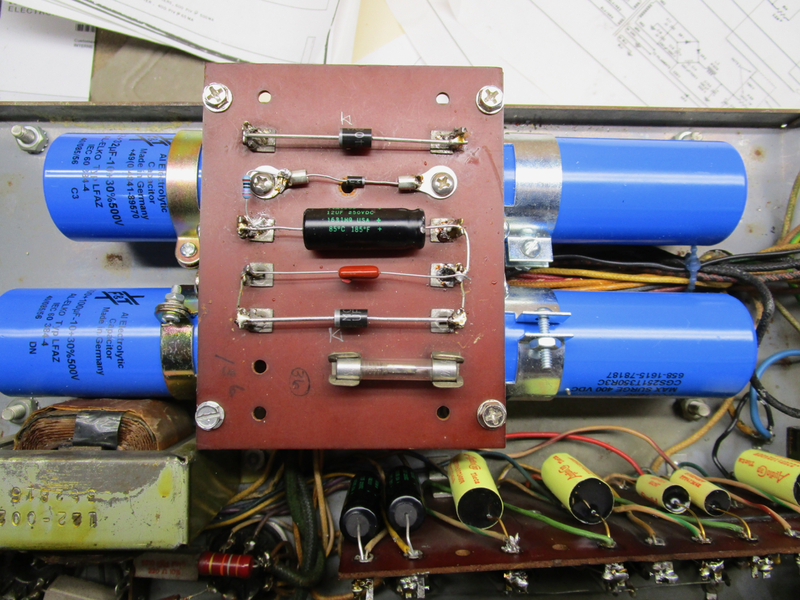 All the electrolytic capacitors were replaced with either Audio or low impedance types, and the low value tantalum by a WIMA film type. 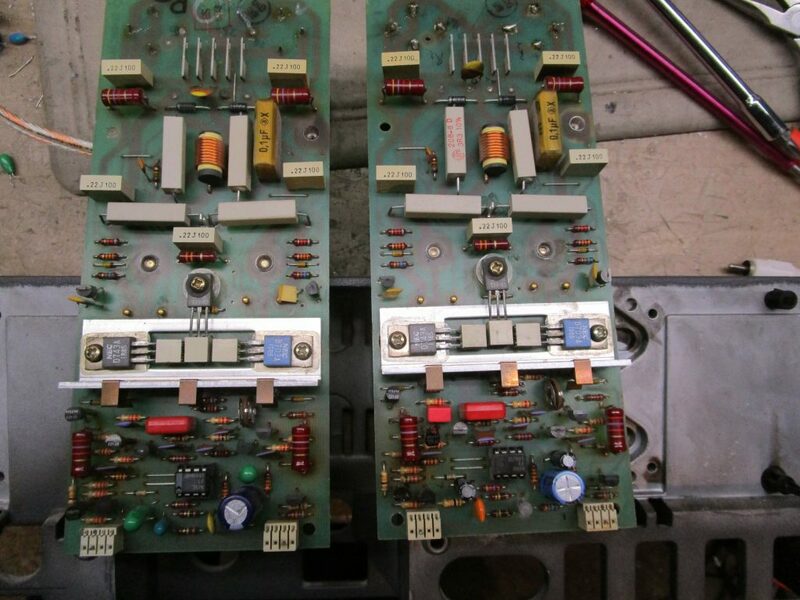 Two ceramic capacitors were also replaced by WIMA film types (or on one unit by polystyrene). Finally the input stage of the power amp employs an LF357 op amp, which has a high slew rate and relatively low noise, however op amps, like most all electronic components have progressed over the last decades and I decided to try some alternatives, however the only drop in replacement is the very expensive OPA627, which at $30 each certainly impacted the budget. On reflection it would have been a good idea to add some further decoupling to the IC power lines (there is none originally fitted), however with the experience with the PCB tracks and lack of space, I opted to forgo this. Given the cost of the IC’s and one unit being a spare, we left the original IC’s in one unit and installed the OPA627 in the other. There was a difference in sound, the OPA unit having a more transparent and dynamic overall sound compared to the “warmer” LF357 unit, though I was really impressed by the overall balance of sound delivered by both of these units and would be happy with either configuration. 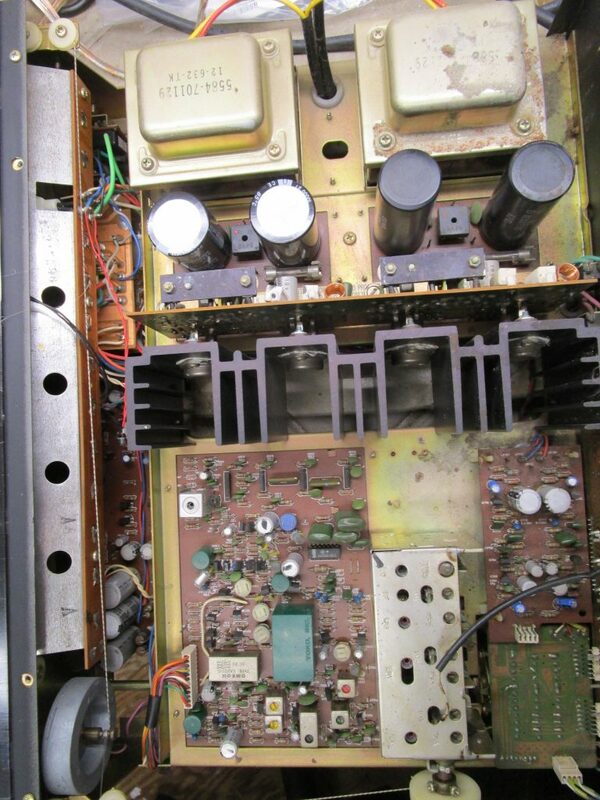 The rest of the unit received the same treatment, use of WIMA film types where appropriate and possible, especially in the replacement of the tantalum units, Nichicon Audio (FG/KZ/KA) types and low impedance types (PW/HE), ELNA SIMLIC II and some MLCC CGO ceramics as appropriate. In all cases the original capacitance values were replaced like for like, though usually with a higher voltage rating. The RF sections only had their electrolytics changed and the CPU board was left alone. The result is two fine sounding receivers, which deserve their premium reputation, though working on them certainly provided some challenges. UPDATE for OPA 627 as LF 327 replacement. There was an intermittent problem with the OPA627, a low frequency oscillation that would occur randomly. The OPA 627 shows pin 8 as NC, as does the original LF 357, however on the revox pin 8 is tied to earth. So after some assistance form the folks at the TI user message board, the OPA 627 was removed and replaced with an OPA 134, with Pin 8 lifted so that there is no connection between that pin and the IC socket. The amp now sounds fantastic again, and there was little or no difference (measurable or listenable) from the OPA 627. I have worked on a couple of HK330 and wanted to know what the bigger brother would sound like. 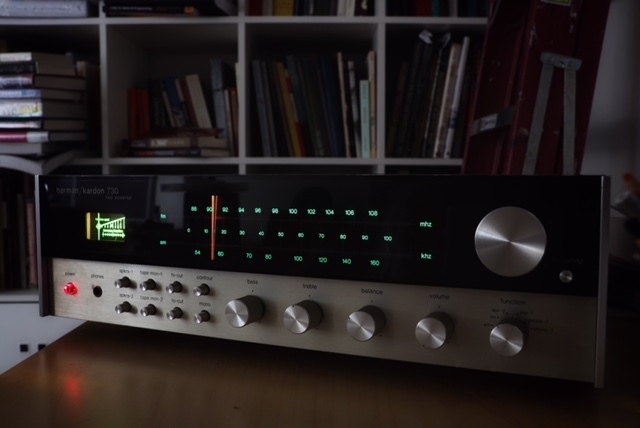 The Marantz 2230/2235 and Pioneer SX737 are the equivalent contemporary peers of this receiver and share a number of common design philosophies, however the HK*30 series has a dual power supply as the most significant difference. It has always been my belief that two independent power supplies are superior to a single power supply in power amplifiers, so when the opportunity to upgrade a HK730 came along I could not resist. There are a number of areas which can be effectively upgraded in this receiver and each of these is outlined below. Power supply: The original power supply used 4,700uf 50V reservoir capacitors which have been upgraded to 10,000uf 80v (the voltage only because of the physical dimensions) and the bridge rectifiers have also been upgraded in capacity (amperage) and voltage. The other electrolytic capacitors have been replaced with low impedance types (Nichicon) of the same values. The lower voltage rail that supplies the lamps and indicators has a separate power supply board, keeping this supply away from the audio chain. Again all the electrolytics have been replaced with low impedance types. Power amp boards: The electrolytics have been replaced with either Audio quality (SIMLIC II) or WIMA film types for the audio path or low impedance Nichicon types for power supply decoupling. Some of the original ceramics have either been replaced with WIMA film or CGO MLCC ceramic capacitors. 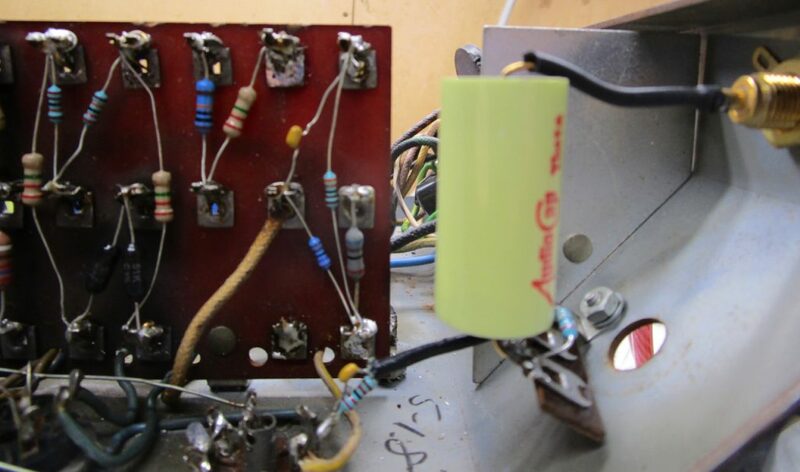 Preamp: All the capacitors have been replaced by either low impedance or audio electrolytics for the higher values or WIMA film types for the lower values with some original ceramics having also being replaced by MLCC CGO Ceramics. Equalizer(Phono): There are a number of modifications that improve the RIAA equalization curve that have been published and tested and these have been implemented,with larger capacity electrolytics, both Audio and low impedance types with film WIMA used in lower values and replacement of some ceramics as described above. The overall result is an improvement in the accuracy and bass response of the phono section, with a number of people preferring this to the Pioneer and Marantz equivalents. RF section: Here there was a minimal intervention approach, replacement of the electrolytics with low impedance and audio types and replacement of of those tantulums in the audio chain with WIMA film types. Finally the lamps were replaced with LEDs giving that great green glow. Overall the receiver sounds excellent. Subjectively there is more dynamics and transparency with a lower noise floor and certainly less distortion than the original. There is a “warmth” to the overall sound that is quite appealing and with suitable speakers, say JBL or other relatively high efficiency types, the overall sound will be certain to impress. In comparison to the Marantz or Pioneer- and this is all from memory, so highly subjective, the HK has more “oomph” and a relaxed sense of “power”. 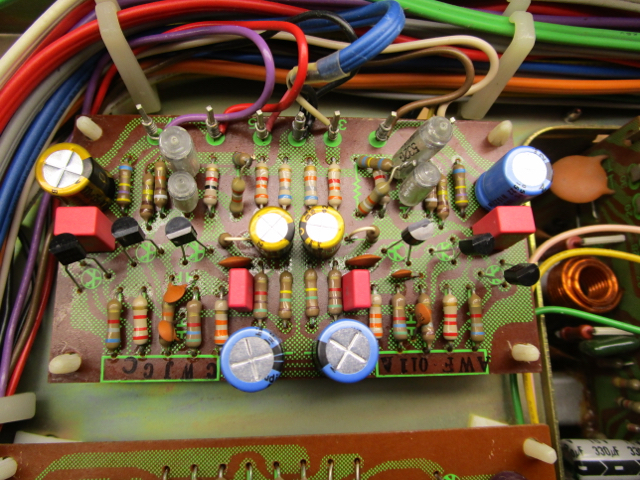 The picture to the power supply shows the power supply under rebuild with the new capacitors installed on the left.The picture below shows the rebuilt equalizer board, which in this example also includes new low noise transistors, which have been matched for Hfe. There are also a couple of resistors that have been replaced with modern 1% tolerance types. I have had two of these since around 1978, and they have traveled the world with me. 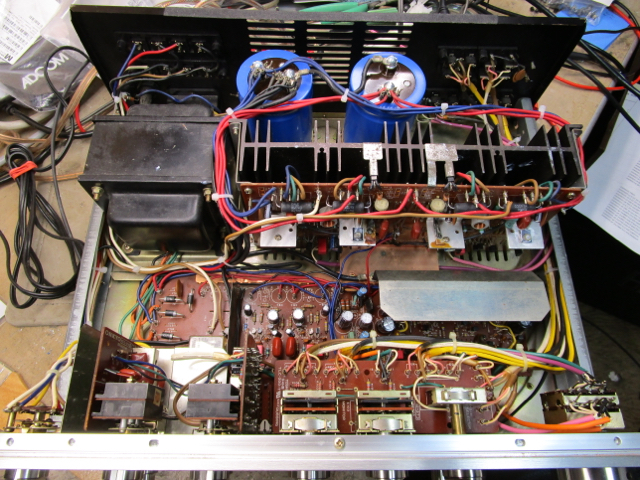 In the late 1970’s I did a recap of most of the capacitors and replaced all the resistors and the main diodes. 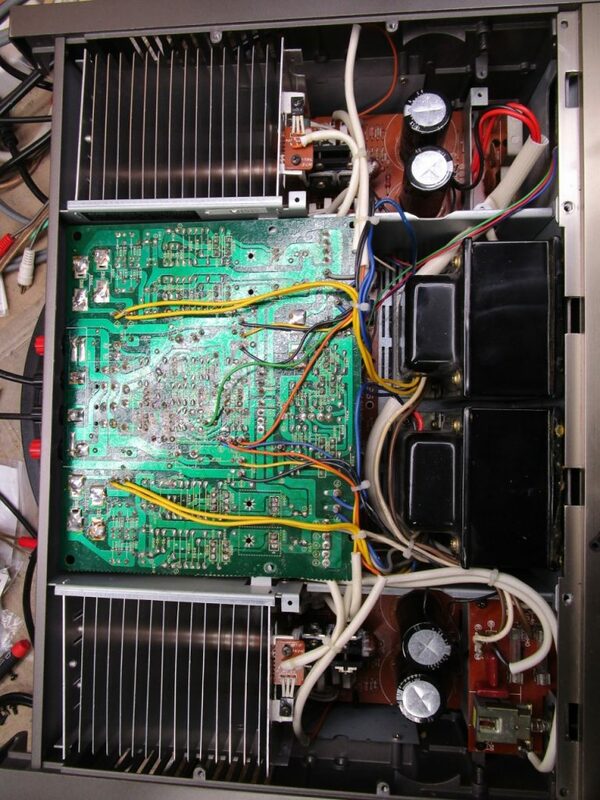 Then in the mid nineties I replaced the main power supply capacitors again (the 250uf units), but left in place the lower values (100uf and 30uf) from the earlier refit. So I had just finished a pair of NAD 2200’s, so I thought now is the time to take these out of my listening rig and give these mac’s some love and attention. So I have replaced all the capacitors, electrolytic and film, which you will see in the photo’s- The main PSU caps are Cornell Dublier 250uf 350v, the 100uf and 30uf are double 100uf and double 30uf 500v cans. The 12uf are all Sprague 250v and the films audiocap. The original diodes are now UF types. Most all the resistors have been changed as well. I also reinstalled the input caps which I had removed previously, though I may remove them again. Aside from the usual drilling out of rivets, the whole exercise went very well. They received new tubes “golden dragons” and Sovtek 6550’s I had bought in the 90’s as spares. They do sound great once again , though I am tempted to try some different tubes, especially that initial 12ax7, and perhaps some other KT88/6550 types. I recently completed an upgrade of an Onkyo A7, which is the most comprehensive one for these amplifiers I have done. 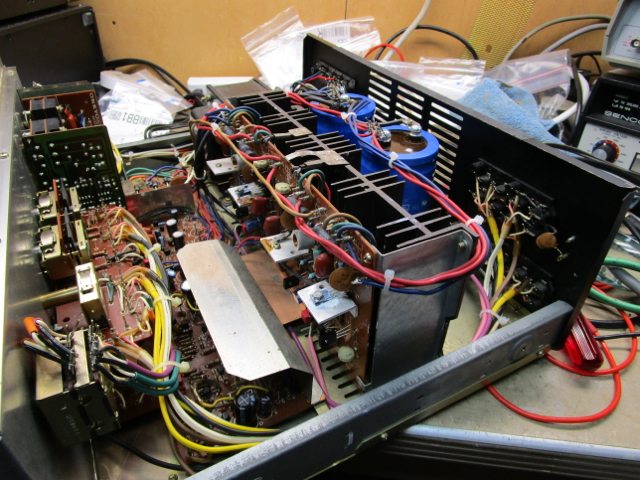 Starting with the power supply section, my customer asked that the 25,000uf 55v main capacitors be replaced, so after an analysis of the available options two Nippon Chemicon 27,000uf 100v units were installed, the original units were also Nippon Chemicon. These units are about 20mm taller, but the same diameter, and sit inside the case with no problems. 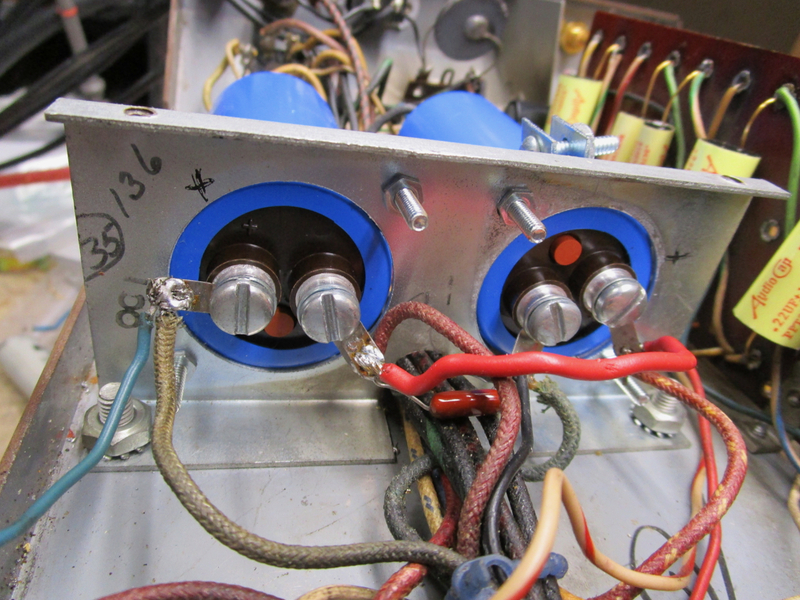 As these had been done I decided to replace the main rectifier diodes, so Fairchild 1N5402were installed. The power supply capacitors were replaced with Nichicon PW series, except for C706 which is Bipolar, and here a Nichicon BP type was used. 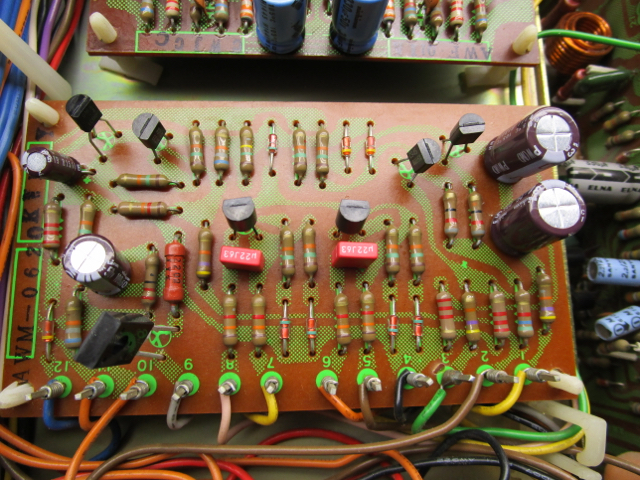 The main output transistors were fine, however I replaced all the driver and low level transistors on the main amp board. 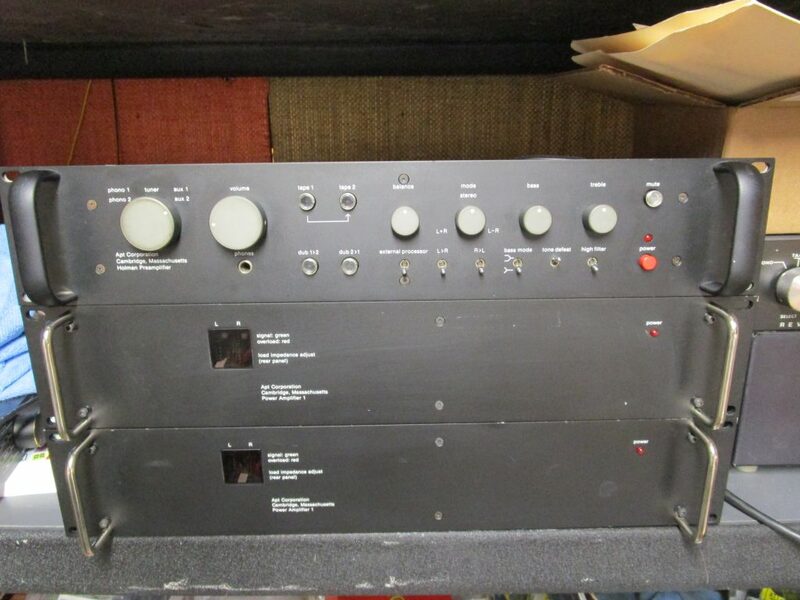 The differential amp was comprised of 2SC1775/2SA872 and these are now KSC1845/KSA992. The bias stabilization transistors were 2SC945 and these are now KSC2383. The driver amp pair was 2SA912/2SC1885 and these are now KSA1220AYS/KSC2690AYS. The complimentary pair were 2SD358/2SB528 and these are now KSC2690AYS/KSA1220AYS respectively. One thing that appears to regularly blow on these units are the 56 ohm resistors R653/R655 and R654/R656- so I always check them and generally replace them as well. All the electrolytic capacitors have been replaced, CV605/C606 4.7uf 50v with WIMA film 4.7uf 50v and the others (C619/C620 and C633~C636) with Nichicon PW units. The emitter resistors R659~R662 were replaced with Dale 1% 5W resistors. The tone control board caps (C409/C410) were replaced with Nichicon KL series low leakage units. On the pre-amp and equalizer board the differential amp (Q301~304) 2SC726 were replaced with KSA992 and the tone amp (Q305/Q306) were replaced with KSA1845. All the electrolytic capacitors were replaced, C201/C202/C303/C304 with WIMA 2.2uf 50v film as were C225/C226/C317/C318 with 1uf 50v WIMA film types. C211/C212 were replaced with Nichicon KL types as were C319/C320. C315/C316 were replaced with Nichicon PW types. All the switches and controls were deoxed , and the unit aligned as per the service manual. The result is a very fine sounding amplifier! May-2017- I have just completed another A-7 upgrade, and measure the distortion at around 0.02% THD+N- which considering the spec is 0.1% is quite an improvement. 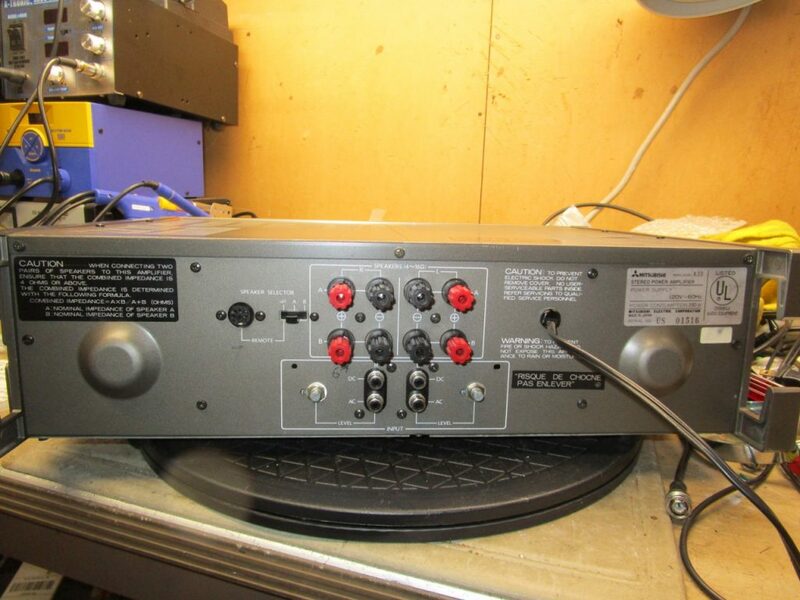 This unit has all new transistors, including the outputs, except for the phono stage, as well as the mods described above. 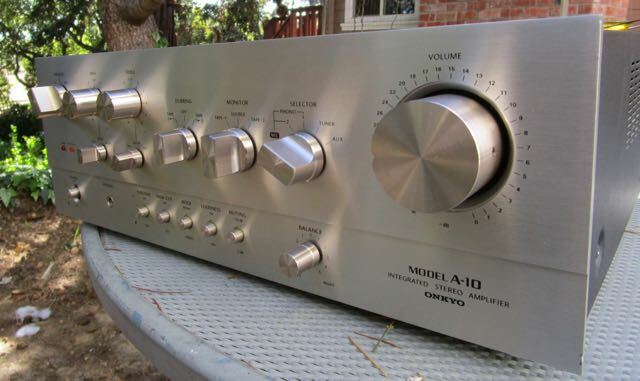 the Onkyo A-10 is the big brother of the A-7 and A-5. These were certainly over engineered for their time and have both a heavy aluminum front plate (about 1/8″ thick) and very good quality components and construction. 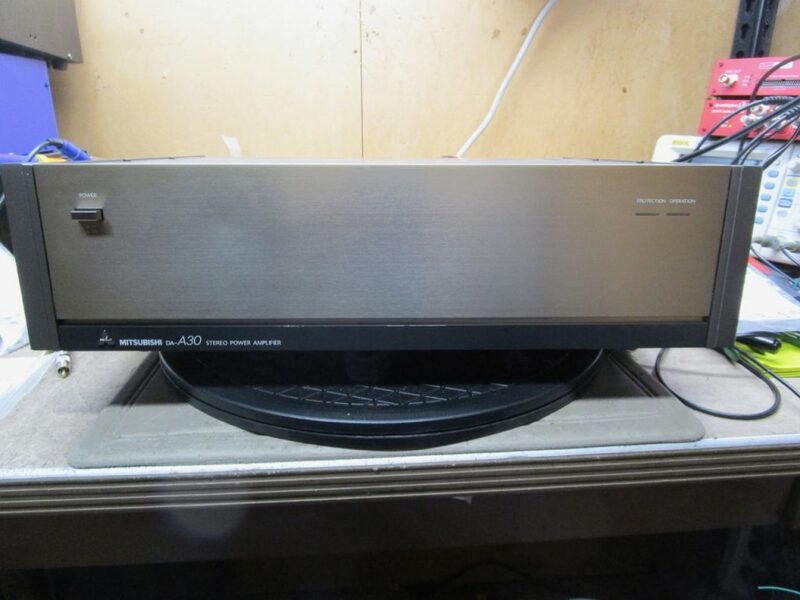 I have only come across one A-10, and it impressed me a great deal, and effortless sound quality, great detail and solid bass..all with great transparency. I mentioned in an Audio Karma post that I proffered the upgraded version to a Krell KAV300i I have and what were the upgrades etc I undertook. All the electrolytic caps except the large power supply units (2 x 13kuf 63V) were replaced. Mostly by Nichicon PW low impedance types, however the original circuit had a number of low leakage caps fitted, and these were replaced by Nichicon KL types- except the 2.2uf and lower values, which were replaced by WIMA film types. C275, C276 were replaced with ELNA Simlic II. C253,254 were replaced with Nichicon KZ, as were C311,312. C337,339 were replaced with Nichicon FG. C203, C204- I tried a few versions (2.2uf Film, 10uf Film- both WIMA, Nichicon KL, Nichicon FG) and finally settled on ELNA SIMLIC II 10uf 50v- for me this kept the detail and was smoothest- also kept the LF square wave tidy. the 10000uf 120v are unobtainable, and the 160V versions are both expensive and dont fit- so I now have settled on Nippon Chemicon 10,000uf 100v (125v surge) replacements, which given that the high power rails are 95v, work very well indeed. These have been operational for over 12 months with no problems. for me this is the best NAD mod yet- more bass, better dynamics and measures well, though there is some low frequency phase shift and roll off from about 50hz downwards-the LAB inputs less so as expected. one thought is to bypass the 10k ufs with a film cap (1uf? )- but again I have not tried this as yet.